The following terms and conditions apply to your access and the use of this website and the services provided herein by the MyKasih Foundation. By accessing any page of this website and/or using the services, you agree to be bound by these terms and conditions without limitation or qualification. Below, please find the most recent revision of our terms and conditions. The use of this site is governed by the policies, terms and conditions as set forth below. Please read over them carefully before using this site or entering data or donating. Your use of this site indicates your acceptance of these terms and conditions. Your donation, in person or through this site, directly or indirectly, through the payment gateway service provider of MyKasih Foundation, indicates your acceptance of these terms and conditions. These terms and conditions prevail unless otherwise stated differently in any other donation related agreement between MyKasih Foundation and yourself. MyKasih Foundation reserves the right to add or modify or delete its policies and/or operating procedures, partially or totally, at any time, at its sole discretion, without notice. Under no circumstances shall MyKasih Foundation or its directors or its officers or its employees or its contractors or its sub-contractors or its volunteers be liable for any indirect, special, incidental or consequential damages of any kind, regardless of the form of action, whether in contract, tort (including negligence), strict product liability or otherwise, even if MyKasih Foundation has been advised of the possibility of such damages. If you have any questions, please write to MyKasih Foundation through electronic mail or postal mail. This web site and the information about services/projects therein are provided on an “as is” basis. MyKasih Foundation makes no representations or warranties, either express or implied, of any kind with respect to this site, its operation, contents, information and/or materials. MyKasih Foundation hereby expressly disclaims all representations, conditions, and/or warranties, either express or implied, of any kind, with respect to this site and/or its use, including but not limited to any implied warranties or conditions of merchantability and/or fitness for a particular purpose or reliability of content and its accuracy. You agree that MyKasih Foundation shall not be liable for any and/or all damages arising from the operation, content and/or use of this site and/or the payment gateways MyKasih Foundation uses to process transactions, including for any infection by computer virus or malware, adware or spyware. You further agree that this limitation of liability is comprehensive and applies to all damages of any kind, including but not limited to direct, indirect, special, punitive, compensatory, incidental and/or consequential damages for lost profits, lost sales, loss of income, loss of time, inconvenience, loss of use or inability to use, loss of bargain, injury to person and/or property, labour, disappearance, non-delivery or delay of any shipment, and/or any other direct, indirect, special, punitive, compensatory, incidental, and/or consequential damages, conditions and/or losses of any kind, no matter whether based upon warranty, contract, negligence, misuse and/or any other causes. You agree that the maximum cumulative liability of MyKasih Foundation, for any claim or liability arising from the use of this site and/or from the donation, application, handling, installation, and/or use of its products/services offered shall not exceed the donation paid at the time of the particular incident minus costs, including but not limited to, administrative costs. 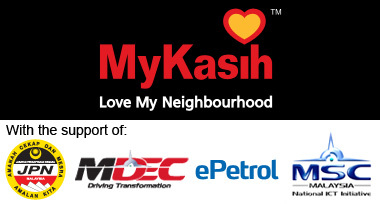 This site is owned and operated by MyKasih Foundation. Unless otherwise specified, all materials appearing on this site, including the text, site design, logos, graphics, icons, and images, as well as the selection, assembly and arrangement thereof, are the sole property of MyKasih Foundation, Copyright Â© 2008-2011, all rights reserved. You may use the content of this site only for the purpose of your personal viewing of information on this site or initiating a donation on this site and for no other purpose. No materials from this site may be copied, reproduced, modified, republished, uploaded, posted, transmitted, or distributed in any form or by any means without prior written permission from MyKasih Foundation. All rights not expressly granted herein are reserved. Any unauthorized use of the materials appearing on this site may violate copyright, trademark and other applicable laws and could result in criminal or civil penalties. All trademarks, service marks, and logos displayed in this website are the property of the MyKasih Foundation and/or their respective third party proprietors as identified in the website. Unless the prior written consent of the MyKasih Foundation or the relevant third party proprietor of any of the trademarks, service marks or logos appearing on the website has been obtained, no license or right is granted to any party accessing this website to use, download, reproduce, copy or modify such trademarks, services marks or logos. Similarly, unless the prior written consent of the MyKasih Foundation or the relevant proprietor has been obtained, no such trademark, service mark or logo may be used as a link or to mark any link to the MyKasih Foundation â€˜s website or any other site. The MyKasih Foundation reserves the right to terminate and/or suspend your access to this website and/or your use of this website at any time, for any reason. In particular, and without limitation, the MyKasih Foundation may terminate and/or suspend your access should you violate any of these terms and conditions, or violate the rights of the MyKasih Foundation, of any other user, or of any third party. The failure of the MyKasih Foundation to exercise or enforce any right or provision of these terms and conditions shall not constitute a waiver of such right or provision. If any part of these terms and conditions is determined to be invalid or unenforceable pursuant to applicable law, then the invalid and unenforceable provision will be deemed superseded by a valid, enforceable provision that most closely matches the intent of the original provision and the remainder of the other provisions of the terms and conditions shall continue in full force and effect. Any rights not expressly granted herein are reserved. These terms and conditions are governed by and are to be construed in accordance with the laws of Malaysia. By accessing this website and/or using the services provided herein by the MyKasih Foundation, you hereby consent to the exclusive jurisdiction of the Malaysian courts in Kuala Lumpur, Malaysia in all disputes arising out of or relating to the use of this website. The MyKasih Foundation makes no representation that the materials, information, functions and/or services provided on this website are appropriate or available for use in jurisdictions other than Malaysia.